For nearly a month, more than 1,500 employees who worked at several Marriott owned and operated hotels throughout the Boston area have been on strike. In noisy picket lines in front of the hotels the protestors are calling for higher pay so they afford to live Boston, improved working conditions and guidelines on sexual assault. 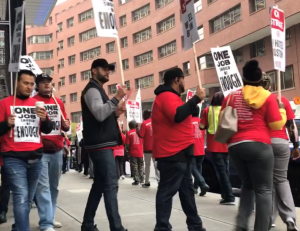 Negotiations between Marriott and Local 26, the union representing hotel and restaurant employees have been stalled for months. On October 1st when talks over wages fell apart, the union employees walked off the job. Local 26 President Brian Lang says the employees will not return to work until Marriott addresses the issues. Every day the protestors can be found marching in front of the Ritz Carlton, the W hotel, and the Westin. The noise they make with whistles and plastic drum containers is disturbing hotel guests and condo owners, and hurting businesses in the area. Police are on duty but the demonstrations have been peaceful so far. Boston Mayor Marty Walsh announced that he will set up a meeting with Marriott Executives and the striking workers in hopes to come to agreement to meet the Marriott’s employees demands.